"See to it you pass through quickly." 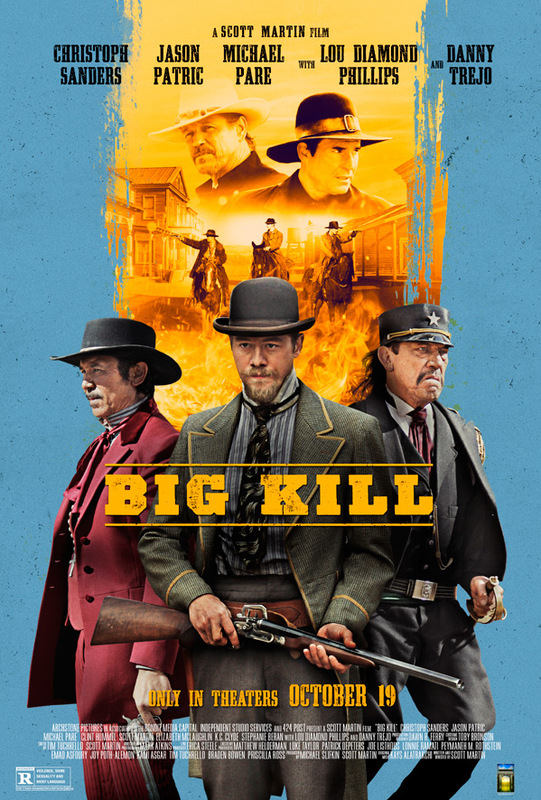 Archstone Distribution has released the official trailer for an action western thriller titled Big Kill, the latest feature from Texas-born filmmaker Scott Martin (Battle Force). The pitch for this one actually sounds pretty good: A tenderfoot from Philadelphia, two misfit gamblers on the run, and a deadly preacher have a date with destiny in a boom town gone bust called Big Kill. Starring Christoph Sanders, Jason Patric, Michael Pare, Lou Diamond Phillips, Clint Hummel, K.C. Clyde, Stephanie Beran, and Danny Trejo. This ain't no Coen Brothers western, but then again nothing is. It's a nice twist the town is named "Big Kill". This looks like it has some grit, but I'm not too sure about it. A tenderfoot from Philadelphia, two misfit gamblers on the run, and a deadly preacher have a date with destiny in a boom town gone bust called Big Kill. After the death of his wife, Jim, the accountant, has come from the East to join his brother in business. Jake and Travis, two misfit rogues with one foot on each side of the law, have come from the south after being run out of Mexico under a hail of gunfire. What they find in the West is a wild ride, a fight for survival, and a moment of decision that will change them all forever. Big Kill is both written and directed by American filmmaker Scott Martin, director of only the film Battle Force previously; he has also produced and written of number of other indie films. Archstone Distribution will release Martin's Big Kill in select theaters starting on October 19th this fall. Anyone want to watch?